MP Jo Cox urged her colleagues to save themselves from her knife-wielding killer as she lay dying in the street, the Old Bailey has heard. Giving evidence, senior caseworker Sandra Major said Mrs Cox told her and office manager Fazila Aswat to "let him hurt me, don't let him hurt you". Mrs Cox, 41, was shot and stabbed in Birstall, West Yorkshire, on 16 June, a week before the EU referendum vote. 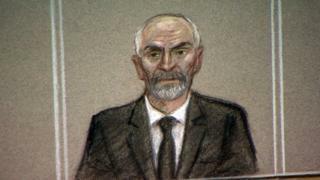 Thomas Mair, 53, of Birstall, denies murdering the Labour MP. He also denies grievous bodily harm with intent, possession of a firearm with intent to commit an indictable offence and possession of an offensive weapon - a dagger. Mrs Cox, a Remain campaigner, and her staff had been heading to a constituency surgery at Birstall library before going on to join an EU campaign stall later that afternoon. The BBC's Sarah Campbell, who was in court, said Mrs Cox's parents and sister held hands in the public gallery as they listened to the graphic and distressing evidence from the two women who had been by her side. Ms Major, who was getting out of a parked car with the MP and Ms Aswat, told the court she saw a man walking past with a gun in his hand. "He raised his arm and shot her [Jo Cox] in the head. She fell backwards into the ground and there was blood pouring down her face," she said. Asked whether the gunman had said anything, she replied: "It was something along the lines of 'Keep Britain independent,' or 'British independence.'" Ms Major told jurors that Mrs Cox had tried to protect her staff even as she was being stabbed. "He started to walk away a little bit and when Jo shouted out then he came back. He shot her twice more and then started stabbing her again. "She was on the floor. She didn't get up again. He was still shouting and shouting," the court heard. The court also heard from Ms Aswat who said she had screamed for help as a knifeman stood over the MP and pleaded for her to run. The man retreated but returned to continue the attack, as more people gathered round. She tried to hit him with her handbag, but missed, the court heard. Ms Aswat said she thought Mrs Cox had been stabbed first and then shot at close range. At the end of the attack, the assailant stood up and said "Britain first, this is for Britain. Britain will always come first," before walking off, she told jurors. Ms Aswat said she held the injured Mrs Cox in her arms and tried to encourage her by talking about her two young children. The police only took two or three minutes to arrive but it felt like a lifetime, she told the court. In a statement read out in court, Bernard Carter-Kenny, 77, described how he was injured as he tried to save Mrs Cox. He had been waiting for his wife outside the library when he heard a bang and saw Mrs Cox, who he recognised, roll into the road, the court heard. "I jumped out of the car. I thought if I could jump on to the back, I could take him down. "I thought he was thumping her until I saw the blood. I saw he had a knife in his hands. "Just as I got short of him, he turned around and saw me. He shoved the knife in and it hit me in the stomach. "The blood started pouring out between my fingers. I saw the blood and I thought 'Oh my God.'" He described staggering away to a nearby sandwich shop, from where he could see the man "going berserk with a knife". Earlier on Wednesday, the court heard how police found a bag of bullets in Mr Mair's pocket when he was detained. Arresting officer PC Craig Nicholls also said he saw what looked like a gun in a bag and described Mr Mair putting his arms up and saying: "It's me". PC Nicholls told the court he and a colleague were in a patrol car when they followed Mr Mair into a cul-de-sac, and asked him to show his hands. As the man dropped his bag, the officers rugby tackled him to the ground. The man then told them: "I'm a political activist", PC Nicholls said. The jury heard a dagger-type knife, an EU referendum leaflet and a wallet containing cards, including a library card, were also found.